Here’s a riddle. What do you call a place that has zero employees but several workers? 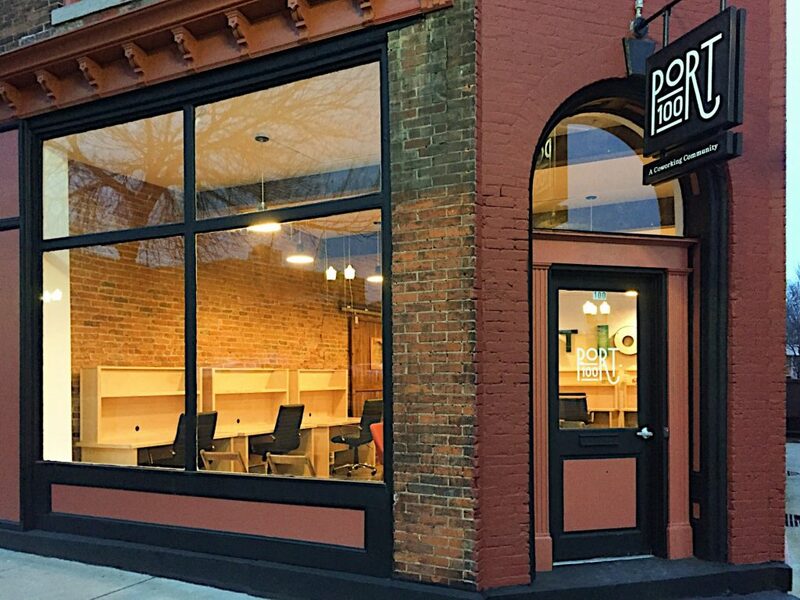 Geneva’s Port 100 is one of the first coworking spaces in the Finger Lakes and is celebrating its second anniversary on November 1. Its name derives from its physical location at 100 Castle Street and its mission to be both a literal and figurative port for workers – a place to connect your laptop and connect with other professionals. The venture is owned by the city of Geneva. It was created under the leadership of Matt Horn, former city manager, and Craig Talmage, an entrepreneurial studies professor at Hobart and William Smith Colleges. With a small but mighty team of supporters, Port 100 was born. 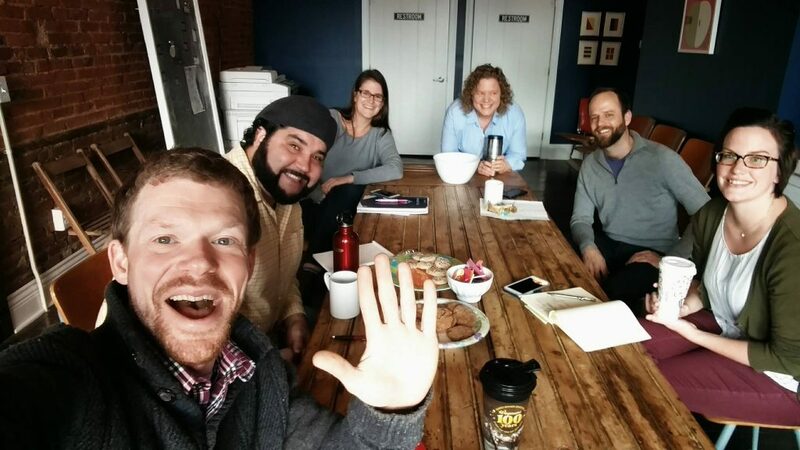 Coworking is growing in the Finger Lakes and around the world. A report from Emergent Research and Global Coworking Unconference Conference (GCUC) forecasts that the number of global coworking members will grow from 1.74 million in 2017 to 5.1 million in 2022. In addition to Port 100 in Geneva, other coworking spaces in the Finger Lakes include SPOT cowork in Victor, Carlson Cowork and Made on State in Rochester, and CoLab Hive in Ithaca. Coworking is sharing a workspace with professionals who work for themselves or remotely for an employer. These spaces offer the self-employed – such as entrepreneurs and freelancers – and remote workers a professional environment separate from a home office. Port 100 is attractive not only in its vibrant, modern and open design, but also in its location – steps from banks, the post office, restaurants, and Seneca Lake. Its mission is to offer not merely a shared space, but a collaborative one, where members can interact with peers, share ideas, and solve challenges to help each other grow. “Everybody here has a collaborative mindset, in terms of having someone to troubleshoot problems with, meet like-minded people, or give back to their community,” said Maureen Ballatori, a founding member of Port 100 and manager of the space. Ballatori, 32, grew up on a dairy farm in Sennett, outside Auburn, and lives in Clifton Springs. She owns 29 Design Studio, a boutique branding and marketing agency. She started her business for more freedom and flexibility after having her two children. Following a stint working from home and coffee shops, Ballatori sought a less isolating, and quieter, environment. Then, she found Port 100. For $150 a month, members have access to the amenities of a traditional office space – dedicated desk, high-speed internet, printer and copier, teleconference room, kitchen, and mailing address for their business. There’s also a $95-per-month virtual membership for up to 5 coworking days per month. Eight of its twelve spots are currently filled. Port 100 dispels the myth that coworking spaces are mostly for millennials. Its members range from the mid-20s to 70 years old and have diverse occupations: a non-profit vice president, web developer, college professor, executive assistant, Cornell PhD candidate, voter advocate, herbalist, and controller. Many coworkers, like Ballatori, are part of the so-called “gig economy” of self-employed knowledge workers and independent consultants. Intuit estimates that gig workers represent 34 percent of the U.S. workforce and will grow to 43 percent by 2020. That trend partly explains the increasing number of coworking spaces in the U.S. One of the most well-known is WeWork in New York City. According to the Wall Street Journal, WeWork now occupies more Manhattan office space than any other company, surpassing JP Morgan Chase. While WeWork is a behemoth, Port 100 thrives on its small size, and its ability to forge productive relationships. While Ballatori serves as the voice of the membership, each person plays a role in the center’s success. To ensure each member is a good fit for Port 100, and vice versa, each prospect starts with a conversation and tour, before an application is completed. Prospective members can also take advantage of Open Coworking Days to test drive the space before joining. Members and supporters of Port 100, including Maureen Ballatori (front right) and Kelly Ernst (back left). Kelly Ernst is another founding member of Port 100. She’s a vice president for the March of Dimes and works remotely for the non-profit organization, supervising staff nationwide. Ernst grew up in Geneva. After college, she joined the Peace Corps, which is where she met her husband, a diplomat for the Malawi government. For 20 years, their careers took them all over the globe. In 2016, Ernst moved back to her hometown. Her decision to anchor at Port 100 is similar to Ballatori’s. Though her work in public health is vastly different from what other members do, Ernst has found tremendous value in sharing a workspace with others. Ernst added that those connections are lasting. Even as members have come and gone, the network they’ve built with each other continues. Port 100 is a lot like the city that created it – welcoming to new people and ideas. Ballatori added that Port 100 helps businesses navigate the unchartered waters that nearly every entrepreneur and startup faces. Interested in a tour of Port 100? Contact Maureen Ballatori at 315-332-1717 or info@port100cowork.com.